Why do I call it 'easy'? The trail was smoother under foot here than anywhere else in the park, and for the most part the grade was modest by comparison to other sections. And finally, the highest elevation reached here was barely above 5000 feet (on Mt. 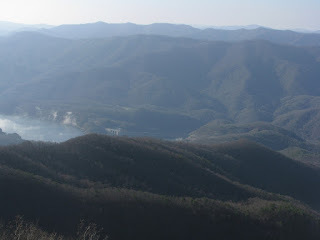 Squires) - by far the lowest high-point of any of the Smoky Mountain Park day hikes. The weather didn't hurt - it was truly summer-like, with temperatures well into the 70's, puffy clouds, and even some humidity. I went through more water today than I have in any previous hike this year. And one last summary note: the thru-hikers are getting thick. Every day there's a new batch entering the park. Today's crop numbered 10 by my late afternoon-early evening survey, including my friend from yesterday, 'Drop Out', who, with his buddy who was hiking to Hot Springs and with a new companion, was doing the same leg as me, all the way from Fontana to Spence Field Shelter - 15.9 miles one way. Most of the thru-hikers settled for the ten miles from Fontana to the huge Mollie's Ridge Shelter. There the crop included four women. Now lets share a little more detail. 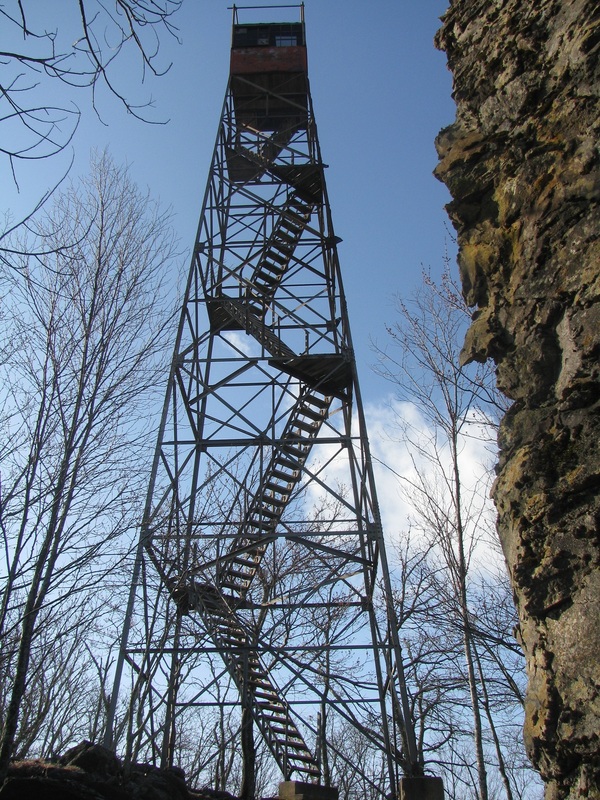 The Shuckstack Ridge fire tower is not for anyone with even a hint of acrophobia. I admit my blood pressure was up a bit as I ascended those rickety, heavily weathered oak steps. But if you can manage it, the view from the tiny observation room at the top is spectacular - well worth the rattled nerves on a clear day. 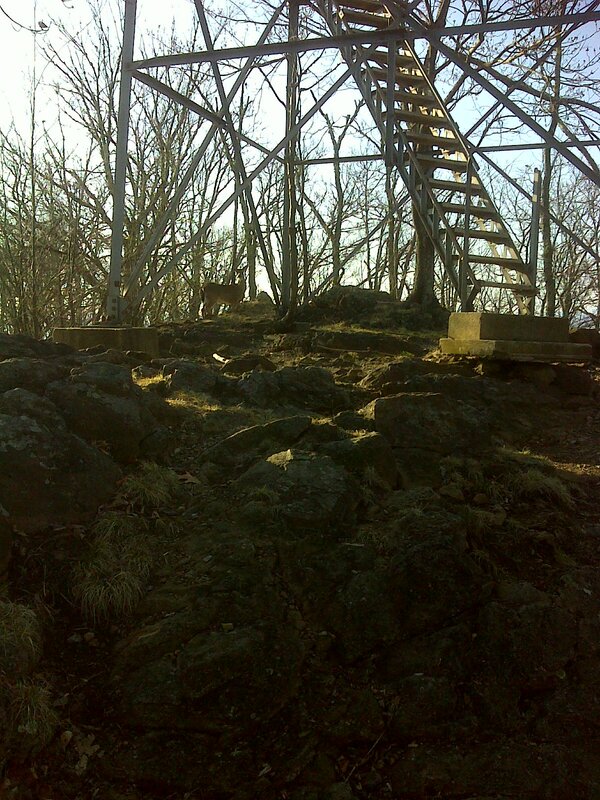 A friend from the wildlife community was waiting for me when I reached the rocky summit where the fire tower perches. He was kind enough to pose. 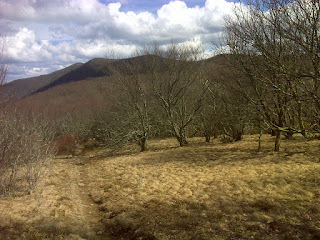 Not so for *my first bear*, who turned and showed me his fleeing hind quarters later in the day up on Doe Knob. 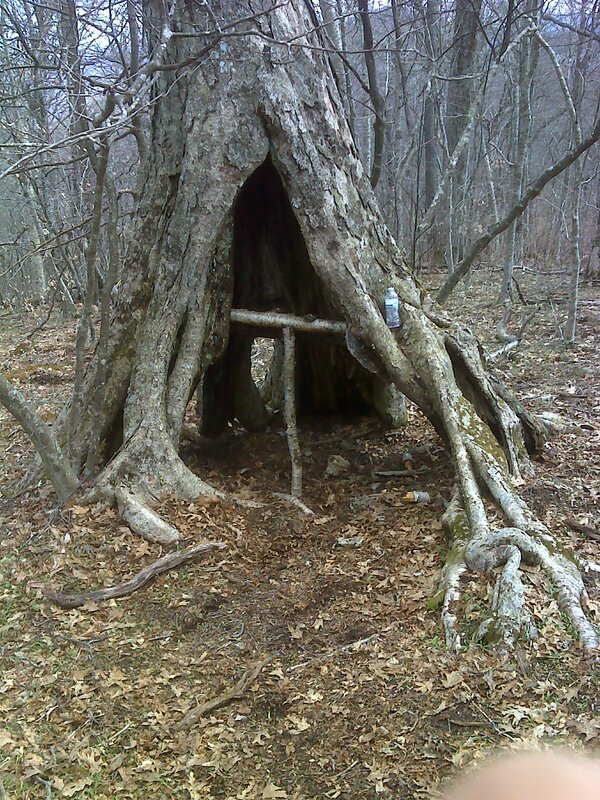 Speaking of Doe Knob, I found a most interesting birch there, with wide-splayed above-ground roots, hollow in the middle, creating a space large enough for one person to sleep in. 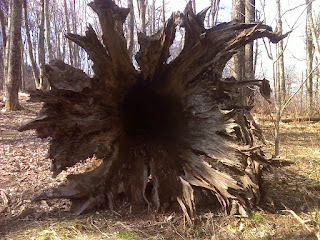 I called it 'TeePee Tree', and I couldn't resist taking on my erstwhile role as 'AT logo Phantom'. This is the result: 'AT Tree'. AT the end of my outward leg, I reached Spence Field, which really is a field (unlike Russell Field a few miles further south). It was a nice diversion from the endless deciduous hardwoods of today's walk. I did not see a single spruce all day - just not high enough elevation in this section of the park. Finally, here's a massive photogenic root system of an overturned hollow behemoth - this structure is taller than me, and a person can easily lie inside that hollow space - one more 'emergency shelter' provided by mother nature. 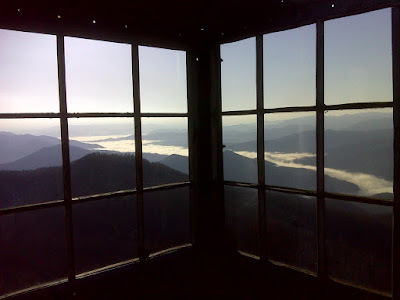 So there you have it, the final, southernmost day-hike through the Smokies and the last touch of Tennessee. Now it's on into North Carolina and the great Nantahala National Forest. Todays photos are only trumped by the fact you saw your first bear of the hike. CONGRATS!! :) I LOVE the photo of the phantom "AT" tree. Made me smile while sitting here at my desk. :P Thanks for including us in your adventure. Kristal - I appreciate your interest. Glad my reports are entertaining you.